The sector requires comparatively lower capital than the bigger industries and its outreach helps in industrialization of the rural and backward areas. The Micro, Small and Medium Enterprises (MSME) sector has grown phenomenally in the last five decades and has become a highly vibrant sector of the Indian economy, playing a crucial role in generating employment opportunities on a large scale. The sector requires comparatively lower capital than the bigger industries and its outreach helps in industrialization of the rural and backward areas. Thus, reducing regional imbalances and promoting inclusive and holistic development with equitable income distribution. As per the “MSME At A Glance - 2016 report” by the MSME Ministry, the sector consisting of 36 million units, as of today, provides employment to over 80 million people. The sixth economic census suggests that there were 58 million establishments in India in 2014 with 128 million persons employed in occupation excluding Crop Production, Plantation, Public Administration, Defence & Compulsory Social Security Services Activities. There are about 11.98 million establishments accounting for 20.49% of the total number of establishments, which are found to be operating from outside household without fixed structure in the country. The sixth economic census report suggests that the activities covered in the Sixth Economic Census have a share of about 86% in total GDP of the country. The MSME sector accounts for 45% of the total manufacturing output and 40% of the exports from the country. The MSME sector has the potential to spread industrial growth across the country and can be a major partner in the process of inclusive growth. Understanding the importance of MSMEs which are complementary to large industries as ancillary units and the sector's enormous contribution to the socio-economic development of the country, it can be said that CSR can positively influence MSMEs’ competitiveness in numerous ways. There are always perceptions that MSMEs are associated with businesses that are conducted informally, and therefore avoid paying taxes, exploit their own labour, provide unhealthy working conditions, pollute the environment and practice production processes that jeopardize workers’ health. However, such preconceptions are not true and the MSMEs’ responsible behaviour and their contributions to labour, community and the environment are significant. 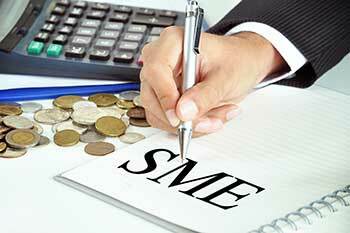 The MSMEs are suppliers to the large corporations and the sector is also responsible for large share of exports. If they don't go by global standards, ethical practices, human rights regulations, environmental norms etc., their exports might fall in the years to come. One fine example of this is the case of Nike in Bangladesh. Even our food processing industry faces lot of restrictions and bans in the western countries. The growing share of the MSME sector in the growth and developmental agenda of the country makes it imperative to incorporate a sustainable approach in the governance of these enterprises which will further boost growth in this sector. Thus, adapting and incorporating sustainability - ecological, social and economical parameters - within their core business practices or adapting Triple Bottom Line approach to their businesses, enterprises' can gain the required depth, strength, positioning and linkages to compete in the global market. Without undermining their involvement in socio-economic progress of the nation, it is expected that the MSMEs will continue to play a huge role in achieving the sustainable development goals. Referring to the global competitive market, it is inevitable that the MSMEs need to have a proactive approach for their businesses to sustain while aligning themselves to the sustainable practices of the supply chain of the large corporations. Today, CSR has emerged as a tool for addressing various long standing problems of the MSMEs in the country in the wake of the changing dynamics and manufacturing push by the government under the Make in India initiative. The MSMEs will give the sector exposure to new methods, processes, technology, excellence and other key parameters of large enterprises, which would enable the MSMEs to enhance their capacities, quality and overall productivity. The concept of CSR is mostly related to the large corporations, although responsibility towards society that goes beyond the production of goods and services at profit is equally important and necessary for MSMEs as well. CSR has proven over and again that it enhances the reputation of an establishment, reduces business risks and enhances stakeholder relations. CSR activities are dominated by the ‘feel-good’ factor, offering emotional returns. At the same time, entrepreneurs do not seek publicity for their benevolence; therefore, many of their actions remain unknown. As the large corporations are engaged in CSR mostly, they also look for suppliers from the MSME sector to be following business ethics, environmental and social norms. This makes CSR for the MSMEs all the more important and they would certainly not like to loose on their part of market share. For example, skilled manpower is vital for growth of any sector and as per survey by PHD Chamber and Avian Media, around 59 percent of employees working in micro medium and small enterprises (MSMEs) are skilled. This provides opportunity for the MSMEs to skill their manpower and contribute towards society in a big way. It can be concluded by stating that for MSMEs, the sustainability of their economic business performance is the foundation for their CSR engagement. It is expected that the MSMEs will continue to be the back bone of the world economy incorporating greener practices that will further lead to inclusive, holistic and sustainable growth. With the change in the market trends, the sector requires a robust business management strategy, a rethinking and an innovative redesigning of its engagement approach in order to gain a competitive edge in the global market and to ensure its sustainability. In conjunction to the Sustainable Development Goals, the MSME's will inevitably have to align their business operations in accordance to the norms and charter. Thus, as a pro–active approach, MSME's have to realize and tap the benefits of social and environmental accountability towards the society. The author, Soumitro Chakraborty is CEO of Fiinovation.